A visit to the farm animal petting area with time provided to feed and touch some of the animals. Finding your way through Witch Hollow Maze, a hand constructed corn maze with lots of dead ends and turns to test your puzzle solving ability. Our Tractor-Drawn Hayride. You never know what you might see along the trail! The return of Pumpkin Farm Songs where the entire group can sing along with their guide in our expanded Backyard Area. Some of these short, action packed songs were written by one of our very first tour guides, Dave Vyvyan Jr.
A visit to "Corn City" to view the pumpkin people scenes and choose your free tour pumpkin and gourd to take back home. Plastic bags are provided for your convenience. Cost: $7 per person (including chaperones). Teachers are free. MUST PRE-PAY for your trip starting with the 2018 season! BOOK your school tour date early!!! Picnic facilities and restrooms are available. Do not include lunch time as part of your tour time. Time for lunch can be reserved for your group before or after your Pumpkin Farm tour. A lunch maintenance fee of $10.00 will be charged per group to help cover additional expenses. Our tour is very complete and the entire time period is filled. Because we offer a variety of different experiences we must keep to a strict schedule; therefore, we ask groups to arrive promptly at their reserved time. If, for some reason, your group arrives late, we may have to shorten or omit some activities. School field trips are available weekdays throughout October. For reservations and more information, please use our contact form or send e-mail directly to FarmerKen@thepumpkinfarm.com. 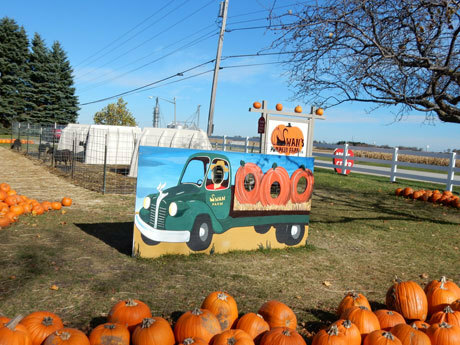 You can also call Swan's Pumpkin Farm at (262) 835-4885.